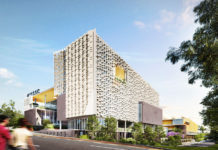 Last year the Brisbane City Council released the Draft Buildings that Breathe Design Guide which set out to provide a shared vision for subtropical building design in Brisbane.  The design guide complimented the City Centre Neighbourhood Plan by providing benchmarks for architects, planners, developers, property professionals and the broader community. 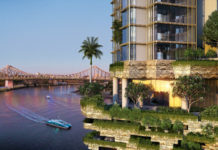 One year on and slowly but surely industry is now responding to the design guide which is set to revolutionise the face of Brisbane’s architectural and planning future. One of the first cabs off the rank is a rooftop retrofit proposal for 192 Ann Street by Japanese funds management company Daisho Co Limited who are also the developers of neighbouring 180 Ann Street. 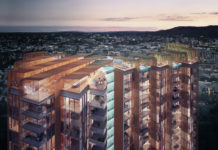 The proposal involves the creation of an 899 sqm multi-purpose rooftop break out space which has the potential to offset urban heat island effects and create a subtropical landscape environment for day and night use. The current underutilised rooftop space has no commercial use and houses only the mechanical service plant rooms. This space is highly visible to the tenants of the neighbouring commercial tower at 180 Ann Street and can be viewed from other high rise buildings throughout the city. The design is heavily inspired by sub-tropical design principals, with a consciousness for shade and amenity. The vision is further derived from Daisho’s desire to create rooftop space that is both functional and contributes to the amenity of the central business district. The redevelopment also seeks to create a memorable landscaped space for staff use and private functions, while also addressing the significant views to King Edward Park. 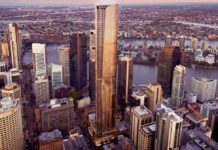 A new pedestrian bridge eight levels in the sky will link the recently completed 180 Ann Street with the new rooftop space and will allow direct access for users of the adjacent commercial tower. Brisbane has a clear identity as a subtropical river city. The subtropical design of buildings and spaces creates a point of difference and distinguishes Brisbane from other capital cities. The re-development of the rooftop space at 192 Central will provide an urban oasis amongst the noise and heat of the city. Described as a sky garden, it will provide a welcome respite from the sights and sounds of the urban environment. The DA number for this development is A004418769.